Sign up for Updates and follow us on Facebook for the latest news and action in the struggle for climate action and justice! “Why is a human rights organization working on environmental issues?” It was a question we used to get…a lot. 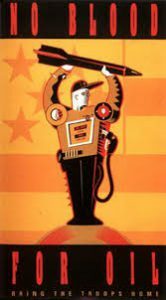 Global Exchange created popular toolkits, distributing thousands at teach-ins, rallies, and on campuses where we were working with large groups of student organizers. We created “No Blood for Oil” t-shirts which very pregnant co-founders Medea Benjamin and Kirsten sold at events and demos by laying them on their bellies to fundraise for campus groups. As coalition-builders, Global Exchange helped to found United for Peace and Justice and CODEPINK Women for Peace, resurrecting the Gulf War slogan, No Blood for Oil. In 1992 Nigerian writer, TV producer and environmental activist, Ken Saro Wiwa was imprisoned for leading a nonviolent campaign against petro giants like Royal Dutch Shell. The dirty extraction and highly explosive refinery operations were backed by the Nigerian military, threatening the very survival of the Ogoni people of the Niger Delta. Shockingly, troops waged a violent scorched-earth war against the Ogoni people for their protest, and despite a worldwide call for his release, Saro Wiwa was killed in 1995. As environmental and human rights abuses continued, Global Exchange’s Board of Directors President Walter Turner led our 2-week fact-finding delegation to the Niger Delta to investigate. As Walter recalls, “It was a dangerous place. Oil companies were acting with impunity, and we witnessed the constant gas flares and other daily violations against the Earth and the Ogoni people.” The delegation also saw evidence of the California-based Chevron Corporation’s participation in armed attacks against peaceful protestors, a local link to these frontline struggles that became the basis for our many years of activism supporting movement-building Justice for Nigeria work, and leading to our own campaign against Chevron. We also set out to “put a human face on climate change.” It was hard for everyday people to relate to something so intangible, yet our national addiction to fossil fuels impacted real places and people. We brought speakers to tour the U.S. from places like the sinking Maldives. Activist Elaine Alexie of the Gwichin First Nation in Alaska, whose traditional hunting and fishing lifestyle was being destroyed by warming temperatures, was one of the featured speakers. And we took people to see the impacts on the ground through our Reality Tours program. We continued to visit these communities –in the Ecuador Amazon – impacted by the oil industry, raising their urgent call for justice. This work continues today. It wasn’t enough to simply ask people to drive less. 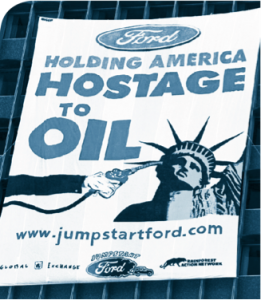 The Jumpstart Ford campaign, in partnership with Rainforest Action Network (RAN) set its sights on pressuring decision makers at Ford Motor Company— the quintessential all-American corporation—to stop selling the dirtiest cars on Earth, live up to their reputation, and lead the industry in fuel efficiency. Splashy actions at auto shows and “adopt a dealer” sit-ins at dealerships educated and activated the general public. Our automaker focus naturally evolved from initially calling out only Ford Motor Company to declaring our “Freedom from Oil,” bringing Canadian Mike Hudema to the Global Exchange family. Known for his book, “An Action a Day Keeps Global Capitalism Away,” he launched colorful and creative actions to ‘Separate Oil from State,’ ‘Save Hockey: Stop Climate Change,’ and hijacking the 2006 Los Angeles auto show—interrupting the General Motors CEO’s speech by asking him to sign a giant pledge sheet committing to make GM the most fuel efficient in the world by 2010. Although GM’s Richard Wagoner refused to sign, the media was eager to listen. We’ve joined with countless activists at Chevron’s headquarters in San Ramon, CA. Antonia Juhasz, well-known author and activist, joined Global Exchange to take on Chevron as our new Energy Program director, coordinating Chevron-affected communities from Indonesia to the Niger Delta, Ecuador and here at home through The True Cost of Chevron network. 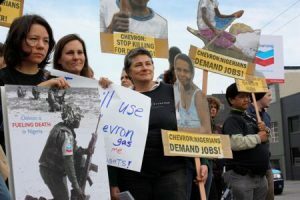 Antonia led a lot of culture-jamming work mimicking the syrupy Chevron green-washed ads by infusing them with reality, and spearheading an Alternative Annual Report handed out to Chevron shareholders at the annual shareholders meetings. The True Cost of Chevron network continues to support frontline communities affected by Chevron to raise their voices and call for accountability and action from this multi-billion dollar company. In 2010, when BP’s corporate negligence resulted in the Deepwater Horizon disaster in the Gulf Coast, we went there to investigate BP executives’ and governmental claims that cleanup efforts were working. 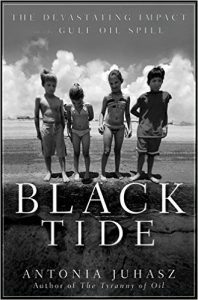 Antonia researched and wrote the book “Black Tide: The Devastating Impact of the Gulf Oil Spill,” and toured the country with victims and the scant few scientists BP hadn’t silenced. In 2006, we began to look North, to Alberta, Canada’s once pristine boreal forest, threatened by the dirtiest form of energy mining, the tar sands. From the Canadian perspective, the exploitation of the forest was directly linked to the U.S. addiction to oil, Canada’s number one oil customer. Its impact on climate change was unparalleled. It was also wreaking destruction on First Nations homes and livelihoods and leaving an environmental scar so large as to be visible from space. 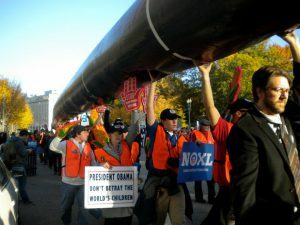 Under the direction of Global Exchange’s next Executive Director, Carleen Pickard, the fight against the tar sands continued, becoming a powerful, national fight and movement against the Keystone XL Pipeline. 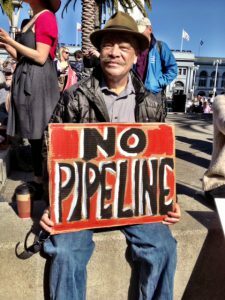 The Keystone battle become one of the biggest political fights over energy in decades, and when President Obama refused to approve the permit one of the climate movement’s greatest victories. Now that is all at risk. President Trump opened the path for construction of both the Keystone XL and Dakota Access pipelines in his first 100 days in office. The fight continues.